Verizon wanted Siri to "Never stop working for you." Ask Siri where she was born and she'll say that she was "designed by Apple in California," but that's only the half truth. She almost belonged on Android phones. The brains behind this voice-activated personal assistant had signed a deal with American carrier Verizon in the fall of 2009, according to a lengthy Huffington Post feature. The objective was to make Siri a default application for all of the carrier's Android smartphones, which are of course powered by Apple's chief rival, Google. Apple, seeing the potential in Siri, didn't just make a counteroffer, it bought Siri, Inc. This ensured exclusivity and killed any hope of Siri for Android phones in the future. The most interesting part is just how far Verizon's deal for Siri is said to have gone. "Somewhere in the vaults of the wireless giant, there are unreleased commercials touting Siri as an Android add-on," reported The Huffington Post. Truthfully, Siri should credit the United States Department of Defense and its $150 million budget for its origin. Apple's artificial friend was spun out of a five-year, 500-person project by the Pentagon and Menlo Park, California's non-profit research institute, SRI International, according to the expose. The undertaking was "by any measure, the largest AI program in history," said lead researcher David Israel. 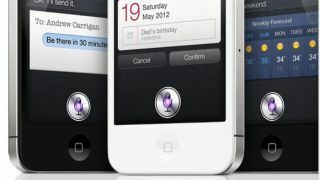 As a start-up, Siri, Inc., initially launched its application as an independently developed iOS application before it was pulled from the App Store. Apple then bought the 24-person company for a reported $150 million to $250 million. Siri was updated with the launch of iPad 4 and rollout of of iOS 6 last year, adding new languages and the ability to open third-party apps, look up personalized sports stats, and send tweets. In addition to expanding the way this personal assistant app is a "do engine," Apple is looking to tweak the responses that Siri gives to commands. The company is searching for a new writer to invoke a little more personality into its voice-activated application. One thing that Siri will never properly respond to are questions about her almost-in-the-bag deal with Verizon that would have brought her to Android handsets. She'll just play coy and direct users to the nearest Verizon stores in the area. Sly.